When SciPy is built using the optimized ATLAS LAPACK and BLAS libraries, it has very fast linear algebra capabilities. If you dig deep enough, all of the raw lapack and blas libraries are available for your use for even more speed. In this section, some easier-to-use interfaces to these routines are described. All of these linear algebra routines expect an object that can be converted into a 2-dimensional array. The output of these routines is also a two-dimensional array. Another advantage of using scipy.linalg over numpy.linalg is that it is always compiled with BLAS/LAPACK support, while for numpy this is optional. Therefore, the scipy version might be faster depending on how numpy was installed. The classes that represent matrices, and basic operations such as matrix multiplications and transpose are a part of numpy. For convenience, we summarize the differences between numpy.matrix and numpy.ndarray here. >>> A*b #not matrix multiplication! >>> b.T  #not matrix transpose! scipy.linalg operations can be applied equally to numpy.matrix or to 2D numpy.ndarray objects. Matrix and vector norms can also be computed with SciPy. A wide range of norm definitions are available using different parameters to the order argument of linalg.norm . This function takes a rank-1 (vectors) or a rank-2 (matrices) array and an optional order argument (default is 2). Based on these inputs a vector or matrix norm of the requested order is computed. where are the singular values of . where for , , and Noise is added to and the coefficients and are estimated using linear least squares. as long as is invertible. In many applications it is useful to decompose a matrix using other representations. There are several decompositions supported by SciPy. With it’s default optional arguments, the command linalg.eig returns and However, it can also return and just by itself ( linalg.eigvals returns just as well). where is the collection of eigenvectors into columns and is a diagonal matrix of eigenvalues. The eigenvectors corresponding to each eigenvalue can be found using the original equation. The eigenvectors associated with these eigenvalues can then be found. is the singular-value decomposition of Every matrix has a singular value decomposition. Sometimes, the singular values are called the spectrum of The command linalg.svd will return , , and as an array of the singular values. To obtain the matrix use linalg.diagsvd. 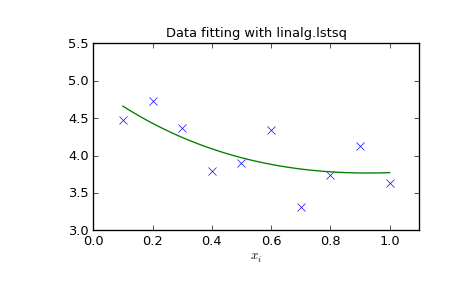 The following example illustrates the use of linalg.svd . where is an permutation matrix (a permutation of the rows of the identity matrix), is in lower triangular or trapezoidal matrix ( ) with unit-diagonal, and is an upper triangular or trapezoidal matrix. The SciPy command for this decomposition is linalg.lu . Because is lower-triangular, the equation can be solved for and finally very rapidly using forward- and back-substitution. An initial time spent factoring allows for very rapid solution of similar systems of equations in the future. If the intent for performing LU decomposition is for solving linear systems then the command linalg.lu_factor should be used followed by repeated applications of the command linalg.lu_solve to solve the system for each new right-hand-side. where is lower-triangular and is upper triangular. Notice that The command linagl.cholesky computes the cholesky factorization. For using cholesky factorization to solve systems of equations there are also linalg.cho_factor and linalg.cho_solve routines that work similarly to their LU decomposition counterparts. implies that and Note, however, that in SciPy independent algorithms are used to find QR and SVD decompositions. The command for QR decomposition is linalg.qr . where is a unitary matrix and is either upper-triangular or quasi-upper triangular depending on whether or not a real schur form or complex schur form is requested. For a real schur form both and are real-valued when is real-valued. When is a real-valued matrix the real schur form is only quasi-upper triangular because blocks extrude from the main diagonal corresponding to any complex- valued eigenvalues. The command linalg.schur finds the Schur decomposition while the command linalg.rsf2csf converts and from a real Schur form to a complex Schur form. The Schur form is especially useful in calculating functions of matrices. where is a permutation matrix with , i.e., . This can equivalently be written as , where and are the skeleton and interpolation matrices, respectively. scipy.linalg.interpolative — for more information. While, this serves as a useful representation of a matrix function, it is rarely the best way to calculate a matrix function. The command linalg.expm3 uses this Taylor series definition to compute the matrix exponential. Due to poor convergence properties it is not often used. where the matrix exponential of the diagonal matrix is just the exponential of its elements. This method is implemented in linalg.expm2 . The preferred method for implementing the matrix exponential is to use scaling and a Padé approximation for . This algorithm is implemented as linalg.expm . The inverse of the matrix exponential is the matrix logarithm defined as the inverse of the matrix exponential. The matrix logarithm can be obtained with linalg.logm . These matrix functions can be found using linalg.sinhm, linalg.coshm , and linalg.tanhm. Finally, any arbitrary function that takes one complex number and returns a complex number can be called as a matrix function using the command linalg.funm. This command takes the matrix and an arbitrary Python function. It then implements an algorithm from Golub and Van Loan’s book “Matrix Computations “to compute function applied to the matrix using a Schur decomposition. Note that the function needs to accept complex numbers as input in order to work with this algorithm. For example the following code computes the zeroth-order Bessel function applied to a matrix. Note how, by virtue of how matrix analytic functions are defined, the Bessel function has acted on the matrix eigenvalues. SciPy and NumPy provide several functions for creating special matrices that are frequently used in engineering and science. block diagonal scipy.linalg.block_diag Create a block diagonal matrix from the provided arrays. circulant scipy.linalg.circulant Construct a circulant matrix. companion scipy.linalg.companion Create a companion matrix. Hadamard scipy.linalg.hadamard Construct a Hadamard matrix. Hankel scipy.linalg.hankel Construct a Hankel matrix. Hilbert scipy.linalg.hilbert Construct a Hilbert matrix. Inverse Hilbert scipy.linalg.invhilbert Construct the inverse of a Hilbert matrix. Leslie scipy.linalg.leslie Create a Leslie matrix. Pascal scipy.linalg.pascal Create a Pascal matrix. Toeplitz scipy.linalg.toeplitz Construct a Toeplitz matrix. Van der Monde numpy.vander Generate a Van der Monde matrix. For examples of the use of these functions, see their respective docstrings. Last updated on Oct 21, 2013.